The conceptual framework for decoupling and understanding of the instrumentalities for achieving it are still in an infant stage. The IRP plans to carry out a series of investigations on decoupling, each of which will result in a report. The reports will aim to support the Green Economy Initiative and also to stimulate appropriate policies and action at global, national and local levels. This first report is simply an attempt to scope the challenges. The report presents basic facts and figures on natural resource flows worldwide. 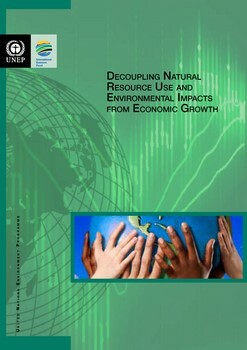 Four country studies embedded in the report show that consumption of natural resources is still rising rapidly. Drawing on these data, the report attempts to outline the issues that now need to be addressed to decouple these material and energy flows from social and economic progress.